1. R.Martin Mateos, T.M.De Assuncao, et al. 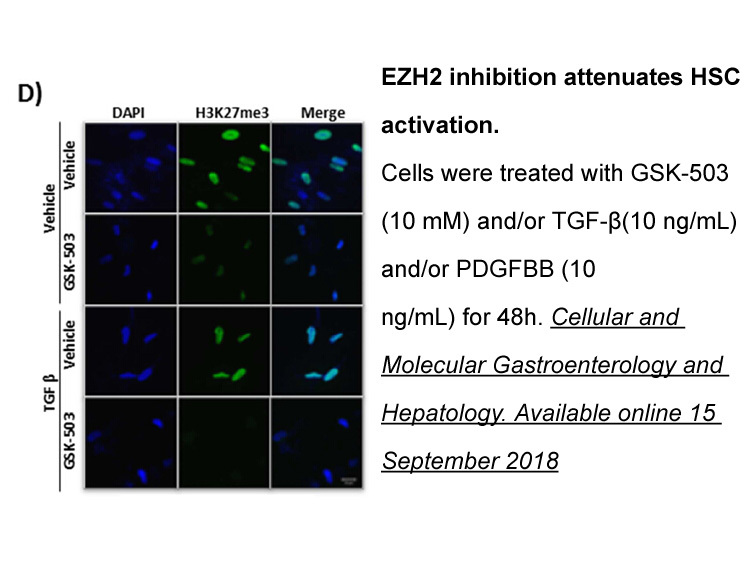 "Enhancer of Zeste Homologue 2 inhibition attenuates TGF-β dependent hepatic stellate cell activation and liver fibrosis." Cellular and Molecular Gastroenterology and Hepatology Available online 15 September 2018. 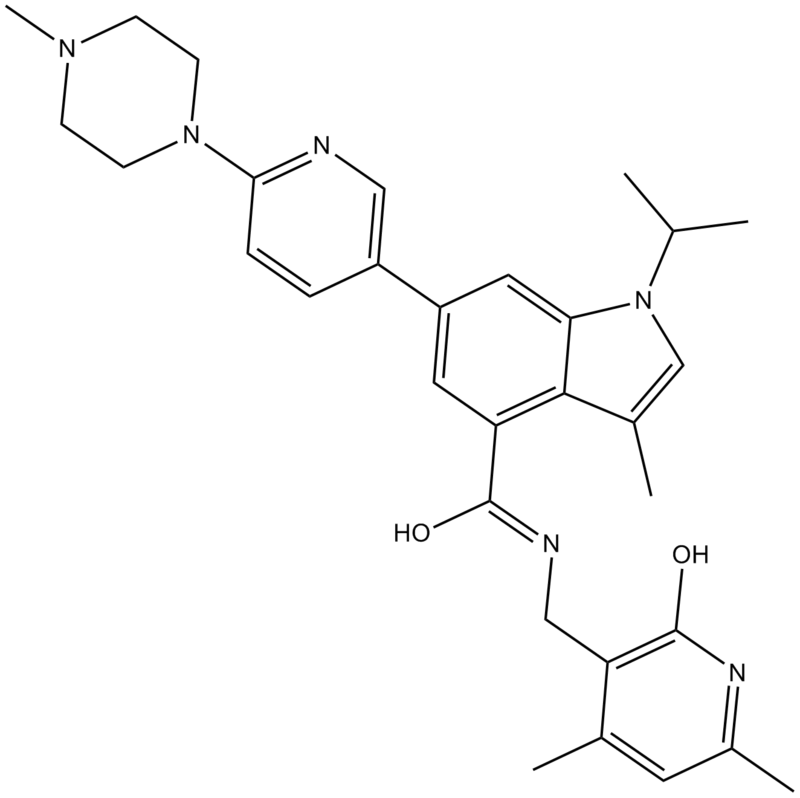 The solubility of this compound in DMSO is >21.65mg/mL. General tips for obtaining a higher concentration: Please warm the tube at 37 ℃ for 10 minutes and/or shake it in the ultrasonic bath for a while. Stock solution can be stored below -20℃ for several months. 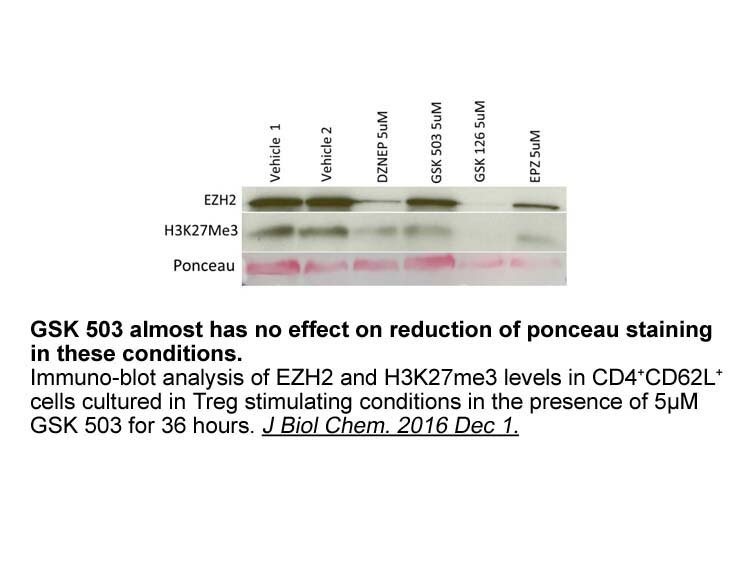 GSK503 significantly reduced H3K27me3 levels, induced G1 cell cycle arrest and slowed down cell growth. GSK503 treatment drastically reduced the emergence of new skin melanomas over time after treatment start. GSK503 treatment prevented murine melanoma growth. GSK503 significantly inhibited the proliferation of tumour cells. In C57Bl/6 mice xenografted murine B16-F10 melanoma cells, GSK503 significantly reduced H3K27me3 levels and inhibited tumor growth. GSK503 inhibited lymph node and lung metastases of melanoma and reduced lung nodule counts.
. Zingg D, Debbache J, Schaefer SM, et al. The epigenetic modifier EZH2 controls melanoma growth and metastasis through silencing of distinct tumour suppressors. Nat Commun, 2015, 6: 6051. GSK503 is a potent inhibitor of EZH2. Enhancer of zeste homolog 2 (EZH2) is a histone-lysine N-methyltransferase enzyme that catalyses trimethylation of lysine 27 in histone 3 (H3K27me3), and then induces chromatin compaction and consequently inhibits target genes transcription. GSK503 is a potent EZH2 inhibitor with anticancer activity. In human melanoma cells, GSK503 significantly reduced H3K27me3 levels, induced G1 cell cycle arrest and slowed down cell growth . In mice, GSK503 induced reversible weight loss by ~10%. In mice with skin melanomas, GSK503 reduced H3K27me3 levels in tumour and stromal cells, and significantly reduced the emergence of new skin melanomas. Also, GSK503 significantly inhibited the proliferation of tumour cells. In C57Bl/6 mice xenografted murine B16-F10 melanoma cells, GSK503 significantly reduced H3K27me3 levels and inhibited tumor growth. Also, GSK503 inhibited lymph node and lung metastases of melanoma and reduced lung nodule counts. GSK503 increased the expression of deoxycytidine kinase (DCK), adenosylmethionine decarboxylase 1 (AMD1) and WD repeat domain 19 (WDR19), which were EZH2 target genes .